Mulesaw: Making an infill plane from scratch 7, shaping a mushroom. 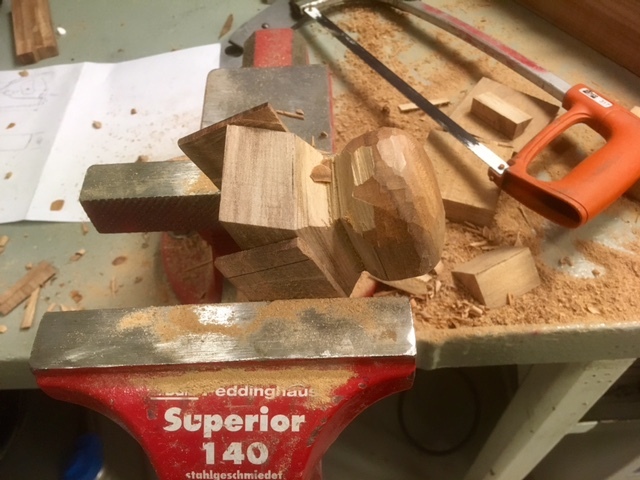 Making an infill plane from scratch 7, shaping a mushroom. I found a brand new fine file in our spare tool cabinet, and I used it to make the plane look nicer than yesterday. I also opened the mouth a bit to the rear of the plane at an angle, so the blade can get through to the bottom and do its job once everything is ready. Since I will need to flatten the end of all the rivets once the plane is completely assembled, I didn't see any point in going all wild with emery cloth etc. The body is flat and reasonably good looking, so it was finally time for me to get back to some woodworking. My experience with working this bubinga is very limited, so I decided that it would be a smart move to tackle the front knob or tote first. I had an idea about making a mushroom shaped knob, and I started by sawing out a block of wood that was slightly oversize. Once the block was ready, I sketched the outline of the mushroom and the lower part of the knob. I used a hacksaw to saw close to my layout lines, and that way remove the bulk of the material. A coping saw would probably have made it a bit more roundish, but the hacksaw did its job admirably. I haven't quite figured out how the grain orientation works on this wood, because it seems to be very prone to tear out. But skewing the chisel and working end grain slowly but surely helped getting the shape out. There is still a long way to go before the front knob is finished, but at least I am back to woodworking which I prefer to filing metal. Front knob straight from the hacksaw. Patience and a sharp chisel will eventually get you there. You are coming up on the part I'm most interested in seeing - fitting the wood into the interior of the plane body. This is also the part that I have been longing to get started on. I am amazed at how much it takes to get a decent looking handle. The wood's looking gorgeous. Also, thanks for the link to Peter McBride's site, very interesting stuff. The wood is incredibly hard, but I agree that it looks really good. I would love to have had some linseed oil out here to treat it with. But maybe I can find some varnish that I can use as a final coating. Peter McBride manages to make it look simple and doable to build a plane, and that is impressive to be able to do that. Very nice! Bubinga is such a nice wood, and it makes a fine plane. Thanks, I haven't got much experience in working with Bubinga, but it seems rock stable which should be good for this application. It cracks me up that you so so much fine woodworking with a hacksaw. I love it. A hacksaw is brilliant for this type of wood. It is rip filed and most likely de to a lot of practice, I have no problems in sawing to a straight line with one. But a real dovetails saw looks better in my opinion. 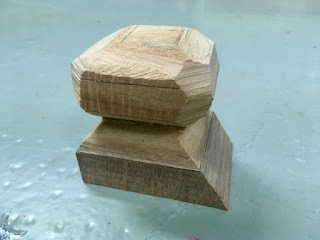 I expect the next steps to be a bit difficult, but I hope that I will be able to make some good looking handles.